Mmm - doesn't quite scan (again!). This is being posted by the Bogger Scheduler so not sure it will work correctly - if you actually read this on Christmas Day I will be doubly amazed! I trust that the day is going well for your good self - that you are quaffing the cooking sherry and watching Rolf Harris visiting the children's hospital....At this precise moment I have possibly been up for a good two hours and thinking about going back to bed! 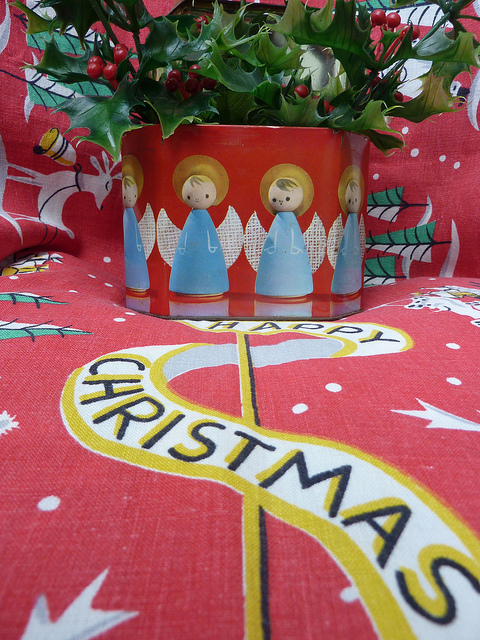 Here are some of my Christmas tablecloths - I will make a note for 2013 to show the embroidered ones then. Can you see top left a trolley complete with cooking sherry? I will post about that if time allows. 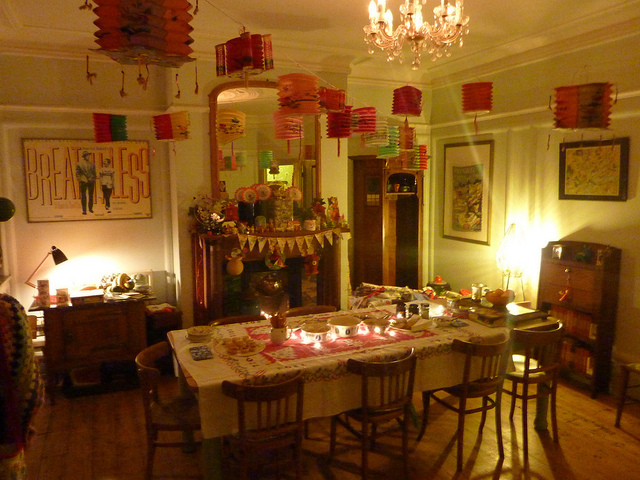 This one shows breakfast last year - I used a ruler to measure the space between settings. .....Have you been watching 'Claridges'? That said I do like a nicely laid table. A bit of oo'ing and ahh'ing at breakfast time - this is emitted mainly soley from myself - can't believe that people just want to EAT! 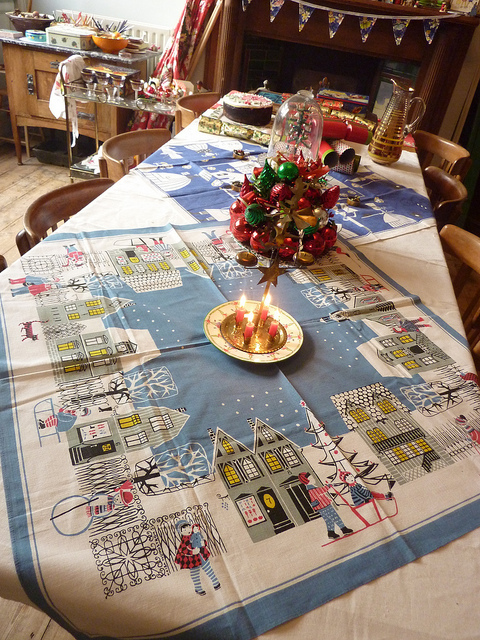 Replete with my favourite vintage table runner (we love it don't we Cindy ;)). I will have to do a separate posting on deers! I see that the candles on the Angel Chimes have burnt down low and they are very tricky to replace!! I will have to double check stocks for this year. 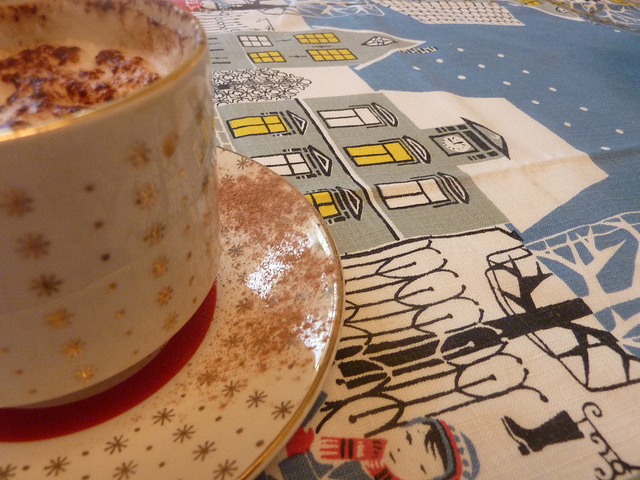 Having a nice tablecloth on the table helps to distract from any cooking disastahs dahling! Not the ruddy lanterns again!!!! 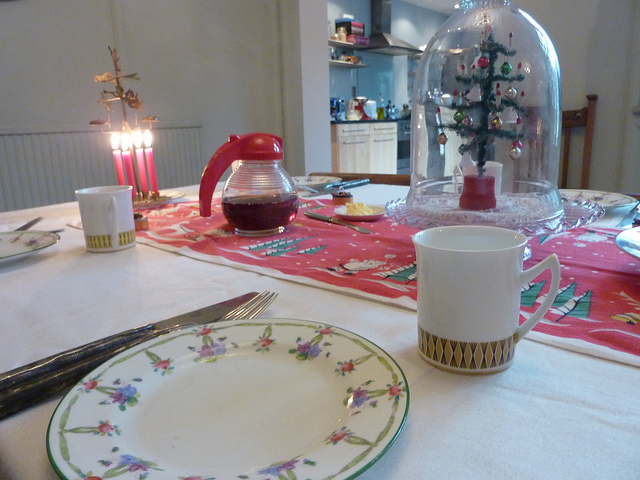 I see that there is a different tablecloth in this photo - 2013 - the year of the tablecloth clear out! 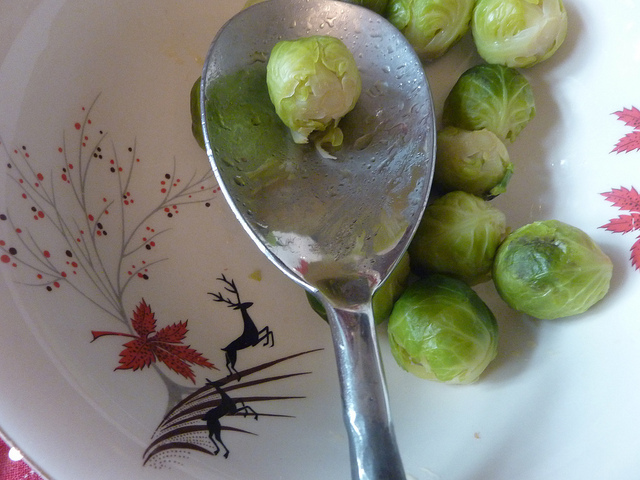 Ending with Brussel Sprouts - of course - why wouldn't you. Not for nothing was I known as the 'Bowel Queen' (a moniker that I was justly proud of) when I was a nurse on the wards - patrolling and checking that EVERYONE (including relatives if they were in the vicinity) had had their bowels open. Rapidly dispensing the lactulose to anyone (including relatives if they were in the vicinity) with a hint of sluggish bowel movement. Have you seen 'Carry on Nurse'....? 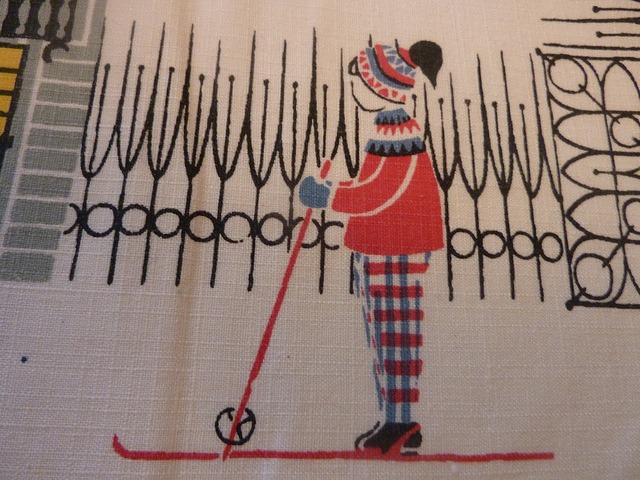 I love the two tablecloths with the skiers and scandinavian type houses on - Im really really into the whole scandy look at the mo. So if you have a tablecloth clearout, do remember the sadly tablecloth deprived blogger at Moonstruckcreations lol (Im sure my sad disposable table cloths dont count as tablecloths at all really). 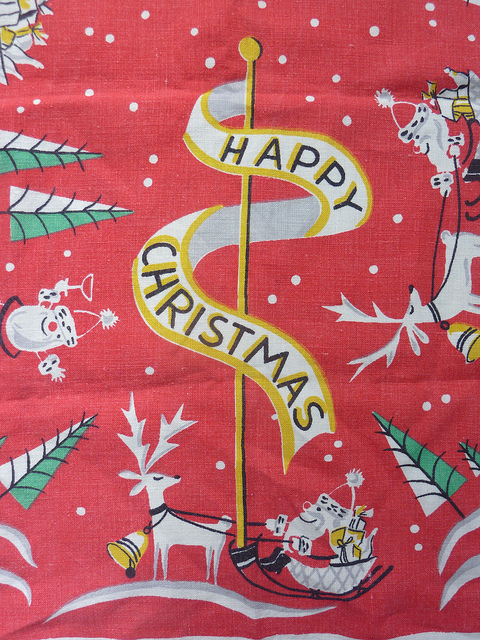 Absolutely fab u lous Jenny - tablecloths et al. I just found your blog today and what a nice Christmas gift for me! I did not understand your problem with Pinterest until I went back and read a few of your older posts, and now I see. I hope these people will read your words and respect your wishes. I, however, will become a follower. Your photos are lovely and I am sure there will be times when I will need a quick fix and stop by to see all the pretties but the rest of the time, I will also read the pretty words. Great to see these angel chimes. We always had these in my Christmas childhood in the States. Setting up the angels was one of the great things about the pre-Christmas festivities but then someone always complained about the ting-ting-tinging. I still have a couple of sets now but as you say, finding candles isn't easy. I have taken to whittling down candles to fit. Yes, please do something on Deer. My artist friend Bet sends me something Deer every Christmas. It's Boxing Day morning and I'm the only one up so I'm catching up with the blogs I missed due to Christmas Eve's canine disaster ... I actually had yours open to comment on but then the mercy dash to the vets ensued - if you haven't read about it at knitso', all was well in the end - so I'm back to wish you and yours a wonderful 12 days of Christmas! Gorgeous tablecloths and the dining room looks amazingly inviting as usual.Always loved Rolf and his painting style,what a treasure! (we watched the One Ronnie for a bit last night) Christopher Robin and Brussel sprouts in the one post,ha.I was raised on one and am the only family member who likes the other.Merry Christmas albeit late. Everything looks so lovely!! 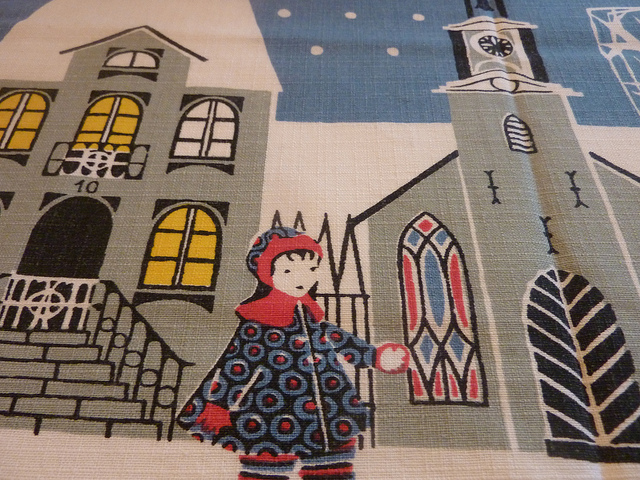 Beautiful tablecloths! 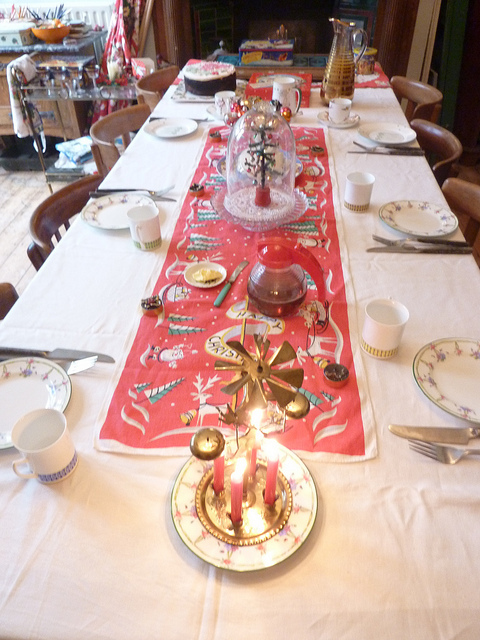 Wow your table looks lovely each time, can't believe you set up for Christmas breakfast though- we just ate a lot of chocolate! (no washing up involved in that!) Hope you had a great Christmas. Thankyou Jenny for such Fun.I love your writing :o) And such a lot of lovely eye candy.